Alhaji Atiku Abubakar, presidential candidate in 2019, revealed Wednesday that he wanted Nigerians to vote for him, not because he can walk but because he can work. Atiku said this via his verified Twitter descriptor, @atiku, when he shared a photo of himself on a treadmill. 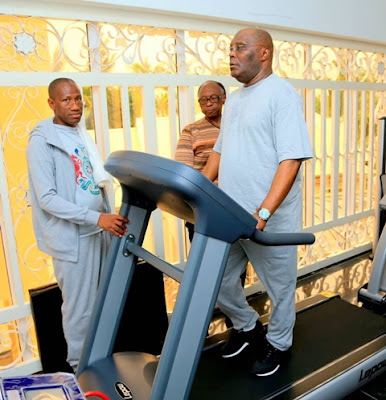 He tweeted, "I'm jogging more than a kilometer and I'm exercising, but it would be self-evident to ask Nigerians to vote for me because of that." I want my party - the PDP, and the Nigerians, vote for me because I do not work because I walk, I will work to create jobs, I will not walk to create an illusion. " Social media was flooded Monday after the chants of the president and the ruling All Progressive Congress on President Muhammadu Buhari who walked 800 meters from the mosque to his home in Daura.